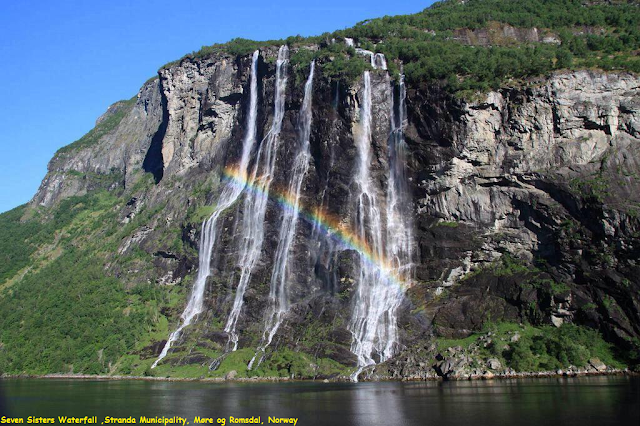 The Seven Sisters is the 39th tallest waterfall in Norway. The waterfall consists of seven separate streams, and the tallest of the seven has a free fall that measures 250 metres (820 ft). The waterfall is located along the Geirangerfjorden in Stranda Municipality in More og Romsdal county, Norway. The waterfall is located just south of the historic Knivsfla farm, across the fjord from the old Skagefla farm. The falls are about 6.5 kilometres (4.0 mi) west of the village of Geiranger. It is part of the Geiranger World Heritage Site. All local residents know the legend about seven sisters - beautiful girls to whom a viking warrior once came to woo. The sisters told him to get the most beautiful veil and the next day to come to choose a future wife. Despite the courage and strength, the viking could not decide the choice. He approached the sisters with a veil in his hands, and froze in indecision. Nowadays, locals associate the snow-white waterfall with a wedding veil. It is noteworthy, that opposite the Seven Sisters waterfall there is another single waterfall, Friaren, the name of which can be translated from Norwegian as 'a groom'. Tourists who want to see the waterfall in all its glory should visit it in May or June when glaciers begin to melt in the mountains. Although the waterfall freezes in winter, it doesn’t become less attractive. In winter scenic places are visited by mountain climbers, for whom the frozen waterfall serves as an ideal route for climbing. The legend of the seven sisters is that they dance playfully down the mountain. Meanwhile, across the fjord, the suitor flirts playfully with them from afar.